I made this corn dip for a football party this last weekend and it was a huge hit. I found it on Pinterest and here is the website it originated from http://ginamarieskitchen.com/2010/10/28/hot-corn-dip-2/. It was delicious 🙂 I made a few changes to the recipe to minimize the spiciness, but add a few more peppers if you love spicy! Preheat the oven to 350 degrees. Mix the cheese, chipotle and green peppers, mayo, garlic powder and corn together. Pour into an oven safe dish. Bake for 20 minutes or until golden brown. Top with diced tomatoes, green onions, and cilantro. Serve with tortilla chips. 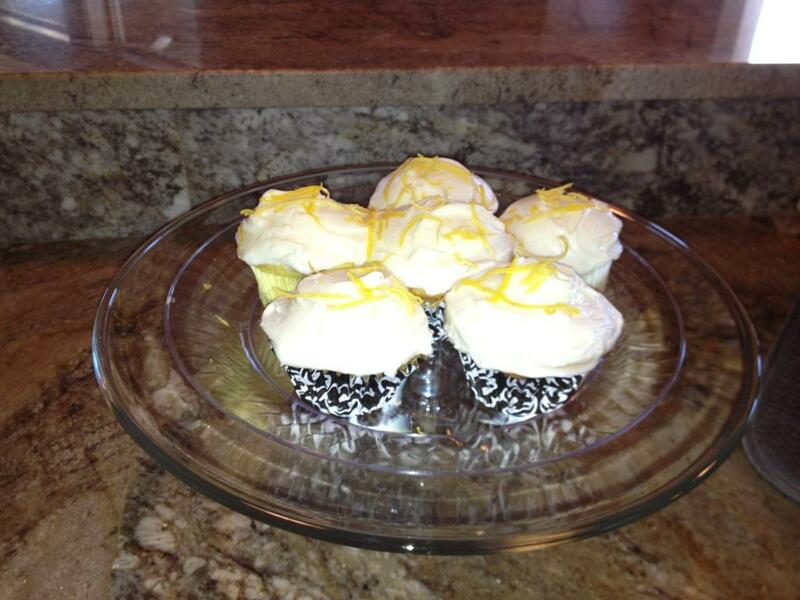 Oh my goodness my friends…it has been way too long since I last posted a recipe! I am finally getting settled into my new apartment and town and also GOT A JOB! Yay! So it’s been a little hectic around here, but the good news is I haven’t stopped cooking and now have many recipes to post on here! This recipe was AA-MMM-AAAZZ-ING. My husband and I loved every bit of this meal and the leftovers. Each time we had the leftovers we were raving again about how delicious it was. Oh and it’s super easy so I hope you try it! This recipe is originally called Cafe Rio Pork however I have never eaten at a Cafe Rio so that means very little. It reminds me very much of a sweet pork I love from a restaurant back home…hence the name change. Season the pork with salt and pepper and place them in the slow cooker. Add brown sugar and salsa and cook on low for 7 hours or high for 5. Remove pork and trim fat if needed. Shred the pork (I usually use two forks and shred it very carefully so I don’t scratch my slow cooker). After shredding cook for about a half an hour longer so the pork can soak up more of the juices. 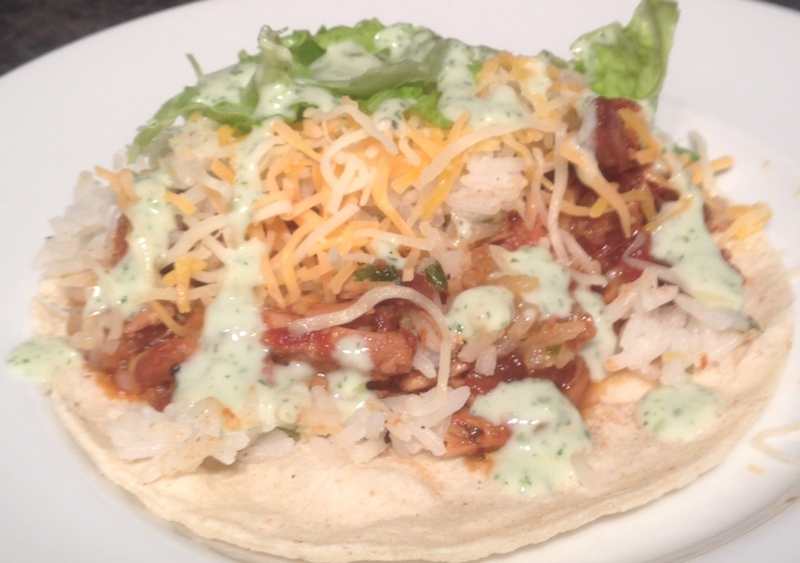 Serve with lettuce, shredded cheddar cheese, and whatever else you like on your tacos! I made this last night and my husband and I both loved it. 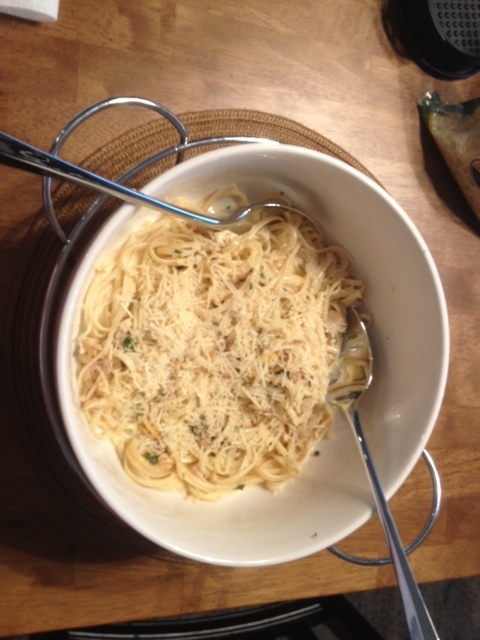 It was very flavorful and my husband made sure I was going to put this recipe on the blog haha. I got this recipe from this blog: http://peaceloveandlowcarb.blogspot.com/2012/01/pan-seared-chicken-with-balsamic-cream.html#.UFCcqbJmSFJ it is the first recipe I have made from this blog and I was definitely impressed. For those of you who do not like cooking with heavy cream I apologize. I know I’ve posted a few of the Pioneer Woman’s recipes and now this recipe that both use cream. I try and switch it up between Cooking Light and these recipes (everything in moderation right?). 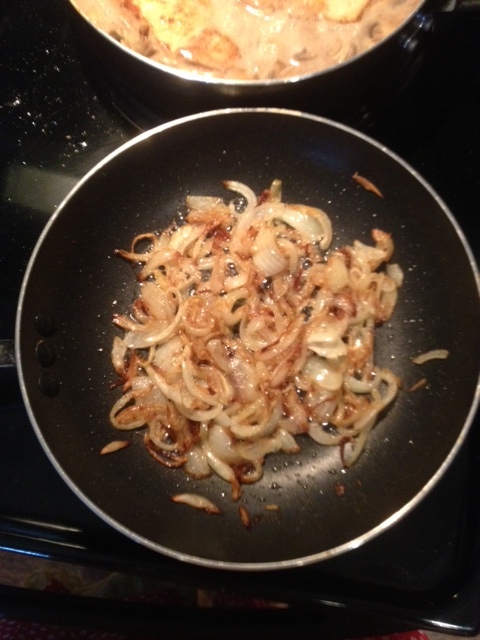 Saute onions over medium heat in 2 Tbs of butter until they are caramelized – About 15 Minutes. When they are golden brown, remove from the heat and set aside. At the same time and in a separate pan, heat the remaining 3 Tbs. of butter over medium-high heat. 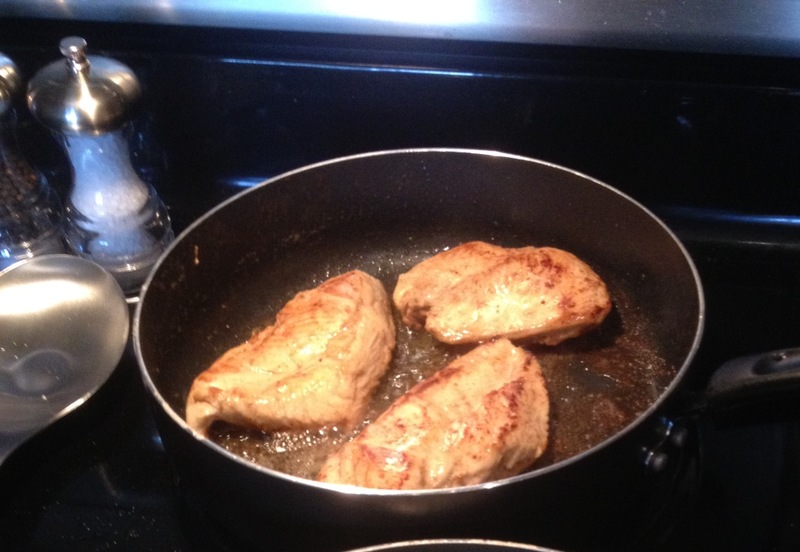 Place the chicken breasts in the pan. 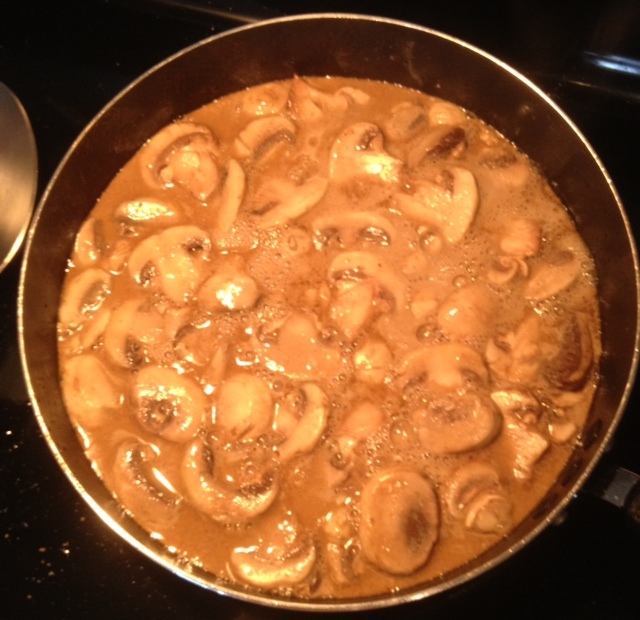 Brown on both sides, remove from the pan and set aside (Note – they will not be all the way cooked at this stage). De-glaze the pan with the chicken stock. Use a rubber spatula to make sure you get all the chicken bits and butter off the pan. This helps to flavor your sauce. Add the heavy cream and the balsalmic vinegar and stir. 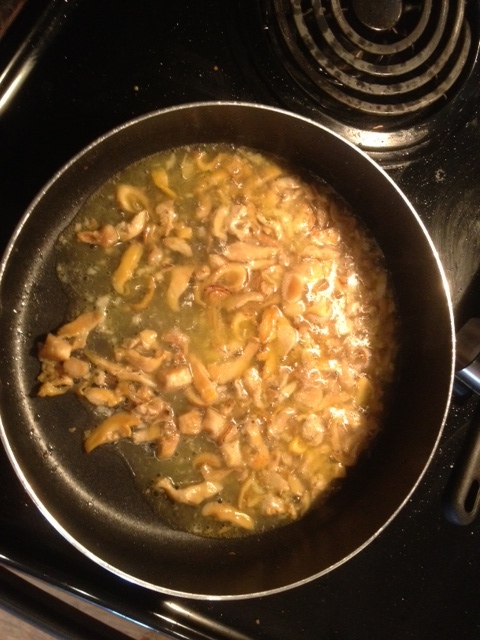 Add mushrooms and reduce heat to low and let simmer for 10 minutes. Add the chicken back to the pan, turn heat back up to medium and saute until the chicken is cooked all the way through. About 10-15 minutes. I served this with rosemary bread and balsamic asparagus. Anyway, these cupcakes are a little more time consuming than boxed cupcakes (really not by much) but they are so so soooo worth the few extra minutes and bound to impress! Prep: Cupcakes and frosting only about 10 minutes! Heat oven to 350°F. Beat cake mix, pudding mix, water, egg whites and oil in large bowl with mixer on low speed until moistened. (Batter will be thick.) Beat on medium speed 2 min. Spoon batter evenly into 24 paper-lined 2-1/2-inch muffin cups. Garnish with grated lemon peel! I’m in the process of trying out all of the cookbooks I received as wedding gifts and I’m loving it. It’s great having such a variety. My Cooking Light cookbook has tons of delicious recipes that are healthy yet flavorful, my Tillamook Cheese cookbook is full of decadent creamy recipes, and so far I’m learning that Pioneer Woman likes to cook with heavy cream and wine….that being said I have been fully satisfied by the taste of every one of her recipes 🙂 If you don’t drink wine…no fear…I have created a “Tips and Techniques” tab that shows you what you can substitute. 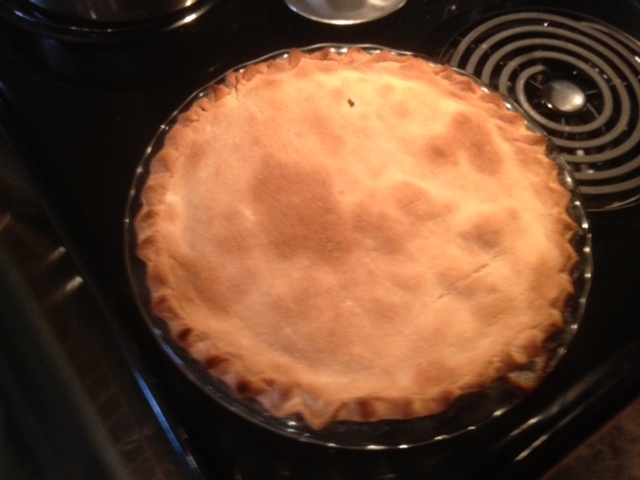 I made this recipe for my hubby and one of his friends last night…NEITHER OF WHICH HAD EVER HAD POT PIE! Crazy I know! And It was definitely a success because they both LOVED IT! My husband doesn’t even like peas, or so he says, and he love love loved this meal! That being said this is another quick and easy recipe. I made it after the guys were home (which means after 5 pm) and it came together so nicely and made the apartment smell amazing! Preheat the oven to 400*. Dice the celery, carrots, and onion. Melt the butter in a large pot over medium heat. Add onion, carrots, celery, peas, and saute for a couple of minutes until the vegetables start to turn translucent. Stir in the chicken. Sprinkle the flour evenly over the vegetables and chicken and then stir in. Cook for a few minutes stirring gently. Stir in chicken broth (stirring constantly), bouillon cube, and wine. Stir in the cream and then allow the mixture to cook on low heat about 4 minutes. Add thyme, salt, and pepper. Remove from heat. Pour the chicken mixture into a deep pie pan or small casserole dish (I used my glass pyrex pie dish). 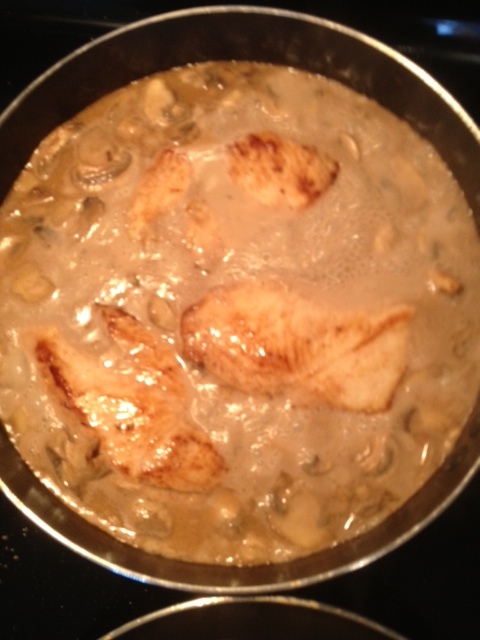 Place the crust on top of the chicken mixture and seal the sides. I love making pretty pie crusts. My mom calls me “The Peencher” because I’m good at pinching pie crusts haha. Anyway, I love the way it looks so if you want a pretty edge but your left hand flat against the side and pinch with your right hand to create little peaks around the edge of the pie. 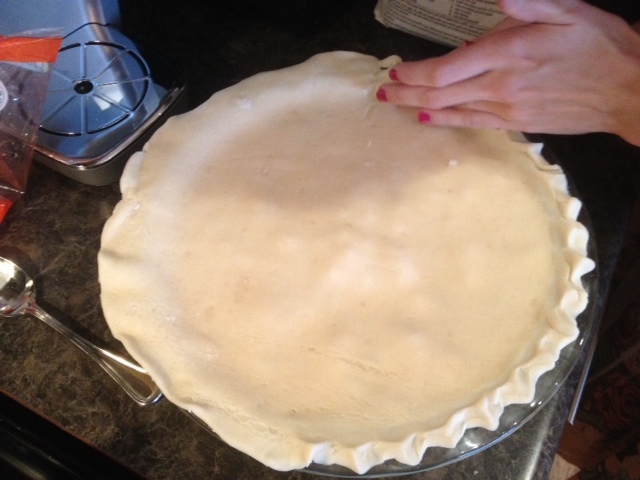 Cut small slits in the top of the pie crust and bake for 30 minutes or until crust is golden brown. Cool for 10 minutes before serving. I saw these on Pinterest and knew instantly I had to make them. My husband is a carboholic and loves loves loves any type of bread and rolls. Sure enough I made these and he told me they were his favorite thing I have made so far. Ha! And they were the easiest! 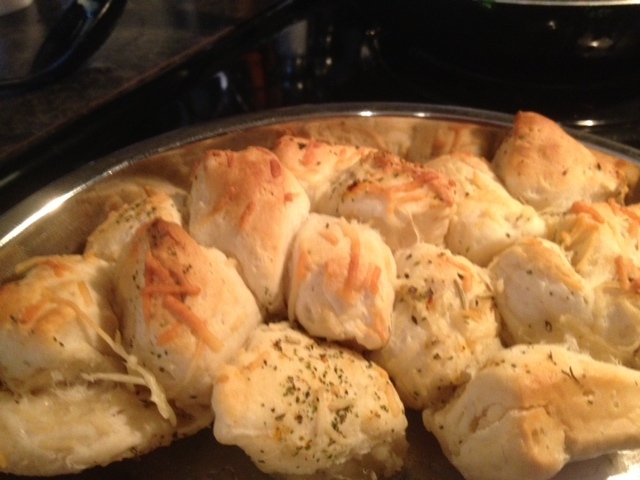 The original recipe comes from this site: http://amandathevirtuouswife.blogspot.com/2012/03/garlic-parmesan-pull-apart-bread.html the awesome thing about these rolls is you can whip them up very quickly and it’s fun to change the seasonings up for a different taste every time. Preheat the oven to 350 degrees. Throw the cold stick of butter in a bundt pan (or even a cake pan if you don’t have a bundt pan) and let it melt in the preheating oven. Bake at 350 degrees for 20- 22 minutes until golden brown. I told you I’m obsessed with my slow cooker 😛 I decided to expand my horizons a little from American and Italian food and I am glad I did because this Hawaiian chicken was awesome! Directions:Simmer crushed pineapple, brown sugar, ketchup, lime juice, soy sauce, garlic and ginger in medium saucepan until thickened and measures 1 1/2 cups, about 10 minutes. Season with salt & pepper. Serve in a serving dish with juices. I served ours over jasmine rice which was delectable! * To make ahead/freezer meal: Prepare the recipe above as directed. Instead of transferring the ingredients into a slow cooker, place in a gallon sized freezer bag. Remove excess air, seal, (label the bag with date and recipe name), and freeze. When ready to prepare, defrost bag completely and pour into a slow cooker. Cook 4 to 6 hours on low. I made this Maple and Brown Sugar Pork Tenderloin last week (from this site http://joelens.blogspot.com/2012/02/12-more-crockpot-recipes-for-stress.html) and my husband and I both really liked it. I did have a problem with the sauce…there wasn’t enough and thickening it didn’t work for us…so I have adapted the recipe to my liking. The pork was very tender and the sauce was sweet and so flavorful. Wash and trim the pork and pat dry; sprinkle lightly with salt and pepper. Place pork in the slow cooker. Combine garlic, mustard, honey, brown sugar, vinegar, thyme and maple syrup for the sauce (feel free to add a little extra of everything if you prefer more sauce to pour over the pork when serving); pour over the pork in slow cooker. Turn pork to coat thoroughly. Cover and cook on LOW for 7 to 9 hours, or on HIGH for 3 1/2 to 4 1/2 hours. Remove pork to a plate and serve sliced with the juices poured over the top. (The original recipe called for pouring the juices in a saucepan and thickening them by adding cornstarch and cold water…it was way too thick- plus I just prefer a sauce over a glaze- and there wasn’t very much sauce to simmer and reduce so I will eliminate this step the next time I make it). We ate this with a side of bread and roasted asparagus with balsamic browned butter! This is another recipe my husband and I made in our cooking class during our honeymoon. It was served as a starter however the chef said he would eat it as a meal and we were so stuffed after the starter that we decided we would eat it by itself as well. This pizzette is unlike anything I have ever made and has so many amazing flavors you will just have to try it to believe me! The website for the cooking school is here: http://evoo.biz/recipe/bleu-cheese-alfredo. Start by making the bleu cheese alfredo sauce. Pour the heavy cream into a saucepan and reduce by half. 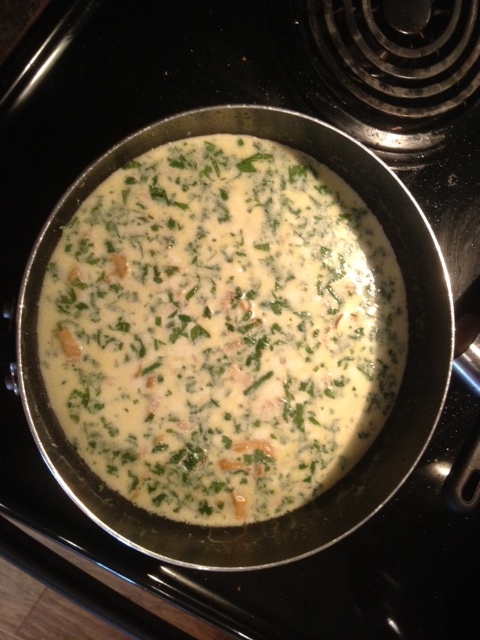 Add the bleu cheese to the heavy cream and stir over medium heat until combined. Season to taste with salt, pepper, and ground coriander. *the chef said the bleu cheese alfredo sauce is also a great sauce to put over a steak. We haven’t tried it yet, but I have no doubt it would be good!